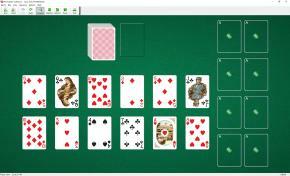 Busy Aces Solitaire uses 104 cards (2 decks). You have 12 tableau piles with one card per pile and 8 foundations. The top cards of tableau piles and waste pile are available to play. You can build tableau piles down in suit. Only one card at a time can be moved from pile to pile. Spaces can be filled with any card.